Having strong credit is a necessary part of anyone’s financial life, as it lays the groundwork for getting access to affordable financing for a variety of needs. Lenders and creditors view good credit as an indicator that an individual presents a safe risk as a borrower. A credit score, which is the three-digit number used to gauge the strength of one’s financial past and present, is one of the first factors considered when applying for a new loan or credit card. However, many don’t realize that a credit score is used for countless other applications, including bonding cost. Whether you are in need of a surety bond for your construction business, a mortgage brokerage, or a money transmitter company, understanding surety bond cost and how credit scores affect it is crucial. Here’s what you need to know when answering the question, how much does a surety bond cost and how your credit score plays a role in that pricing. Why Do Surety Bonds Require a Credit Check? Surety bonds are offered by surety agencies and bond providers to many different professionals spanning multiple industries. In some cases, a surety bond is required as part of the licensing process, meaning without one, business can’t be performed legally. A bond is often a requirement because of the protection it provides to the customers of the bondholder or the state or city requiring a bond be in place. If something goes wrong, such as a project left uncompleted, a claim made be made against the bond to help cover financial losses or other damages. Given this structure of a surety bond, a credit check is required as part of the application process. Businesses and industry professionals are extended a form of credit when purchasing a bond from a surety agency. This is because any claim against a bond must be repaid by the bondholder after it is initially paid by the bonding company. To ensure the bondholder can and will repay bond claims that arise in the future, surety agencies check credit scores to see how much of a risk an individual represents. While you can still get a bond with bad credit, it pays to have a good financial track record before applying for a surety bond. Having bad credit means you have negative entries on your credit report that are dragging down your credit score. 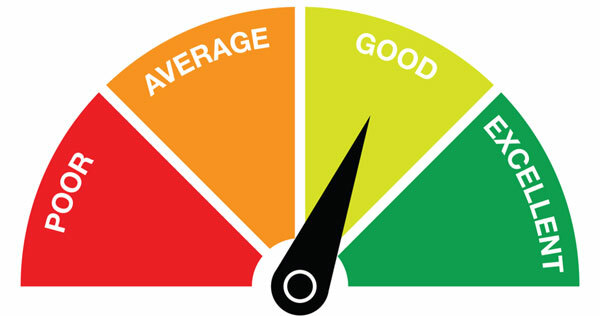 Credit scores range from 300 up to 850, with the lowest being considered the worst possible score. Bad credit is defined as a credit score falling below 600, although some creditors may consider a credit score from 600 to 650 as bad. When you have a low credit score, creditors see you as a much higher risk than someone who has a score above 600. There are many reasons why bad credit happens, from missed payments to major financial pitfalls like a bankruptcy or foreclosure. Regardless of the reason for your bad credit, it is helpful to know what it takes to get it back to good or great over time. Any credit score above the 750 mark is considered excellent, while scores between 700 and 749 are deemed good by most creditors. Getting to these credit score ranges requires some work when it comes to your financial activity. Having a good handle on credit card debts, making payments on time, and avoiding serious negative marks helps keep a credit score in the good range. When these activities aren’t the focus, bad credit is the result. Two popular credit scoring models exist today – FICO and VantageScore. Both companies lean on the same detailed information about your financial history to calculate your credit score. Payment history – this accounts for 35% of your credit score calculation. Credit scoring models take into consideration your history of payments to various accounts, including loans and credit cards. If you have missed payments in the past or you paid past the due date, your credit score is lowered. Amounts owed – this comprises 30% of your credit score calculation. Sometimes referred to as credit utilization, this category takes into account your current revolving credit accounts (like credit cards) and how the balance owed stacks up against the available credit line you have. If you consistently push the limits of your credit cards and don’t have much available credit to use, your credit score suffers. Length of credit history – this accounts for 15% of your credit score. A longer history of accounts works more in your favor than a short credit history. New credit accounts – this accounts for 10% of your credit score. Taking out too many new credit accounts in a short period of time may be a red flag to lenders, and ultimately, it will reduce your credit score. Type of credit used – this comprises 10% of your credit score calculation. Having a mix of different credit accounts, such as credit cards, personal or auto loans, business loans, or a home loan, helps show creditors you can be responsible with various types of credit. How is a Surety Bond Cost Calculated Based on Credit Score? Your credit score, based on the factors mentioned above, plays a role in how your surety bond cost is calculated. Using your credit score provided by one of the three credit bureaus, a surety agency will price your surety bond based on how much risk you present. Bond providers determine bonding cost as a percentage of the total bond amount needed, typically ranging from 1 to 15%. So, if you need a surety bond of $25,000 and you present a low risk to the surety agency, your bond cost may be as low as $250 (1% x 25,000). However, not everyone is eligible for the lowest bonding cost because of their credit history. How Does a Credit Score Affect Bond Cost? Bondholders who are considered the lowest risk will pay the lowest percentage cost for their surety bond. Those who have bad credit pay a much higher percentage since they are perceived as a higher risk to the bonding company. Consider the example above of a $25,000 bond requirement. For someone who has bad credit, the percentage of bonding cost may be 10%. That would mean a bond costs $2,500, not $250. As you can see, having a low credit score has a big impact on how much a surety bond costs. The good news is that you can get a surety bond even when your credit is not in the best shape. Getting a bond with bad credit is possible, but you are likely going to pay more as far as the percentage of the total bond amount than someone with good or excellent credit. If you have bad credit but are able to provide other pieces of documentation that show you are responsible in other areas of your business or profession, you may pay less for your surety bond. All of these factors come together to determine how much does a surety bond cost for you.